Fenugreek, most popularly known as Methi is an Indian herb, the stems, leaves and twigs of which are used for cooking, medications and for nutritional value. The leaves and seeds of the plant in particular, are of high medicinal and nutritional value. 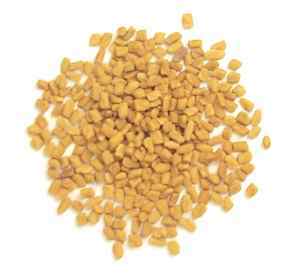 Fenugreek seeds are rich sources of carbohydrates, proteins, Vitamin A and C, iron, calcium and minerals. Apart from providing energy and roughage, Fenugreek prevents constipation, improve digestion, stimulates liver and spleen, purifies blood and serves as appetizer. The twigs and leaves of the plant are also used as poultice for ulcers, boils and abscess. The Fenugreek seeds contain Diosgenin which is more of a raw material substance used in medical steroids by pharmaceutical industries. The seeds of Fenugreek have antiseptic and anti-inflammatory properties and can be used for relieving pain. Fenugreek seeds can be boiled and made to a thick paste and applied on skin injuries like rashes, wounds and boils as a first-aid measure. Also a tablespoon of powdered fenugreek seeds can be mixed in a cup of warm water, simmered for ten minutes and strained. This can be used for gargling, which provides relief from sore throat. Also one tablespoon of fenugreek seeds when boiled in 300ml of water and reduced to half, and when the mixture is drunk regularly for ten days, it provides relief from sinusitis. The seeds of Fenugreek are beneficial for diabetic patients too. When regularly given in varying doses, they reduce reactive hyperglycemia in diabetics. Apart from reducing glucose levels, the triglycerides and serum cholesterol levels can also be significantly reduced by use of Fenugreek. The easiest method to consume would be by preparing decoctions (two tablespoons of seeds in a cup of water, reduced to half, thrice a day). This decoction also helps in better lactation in nursing mothers. Due to the cooling and soothing effects of Fenugreek seeds, they are considered beneficial in skin irritation and inflammation. The other benefits of this herb includes solving digestive disorders, numbness of the organs, anemia, fever, bad breath, respiratory infections, mouth ulcers, dandruff, prevents blackheads, pimples, and premature ageing.